While he’s exercising filmmaking muscles that are mighty spry for a 90-year-old, no one will mistake Andrzej Wajda’s latest feature for an expression of joie de vivre: “Afterimage” is a somber portrait of a Polish artist who, unlike his portraitist here, was defeated by the fickle shifts of political ideology imposed on art. This respectable if somewhat monotonous drama won’t be an easy sell to offshore audiences for whom its subject, avant-garde artist Wladyslaw Strzeminski is hardly a household name. Moreover the film references his defining triumphs just in passing, focusing instead on bleak later years when he was persecuted for failing to tow the Party aesthetic line. The result is another significant chapter in Polish history from Wajda, albeit one unlikely to travel as widely as some of his past subjects. When we meet the Soviet-trained avant-garde painter (played by Boguslaw Linda), he’s already in autumn glory of a celebrated career: admired by colleagues, worshiped by his students at the School of Visual Arts in Lodz. He’s rightly regarded as a leader in the Constructivist movement that dominated revolutionary art of the 1920s, as well as a crusading advocate for modern art within Poland. After losing both an arm and a leg in WWI military service, his WWII deprivations were comparatively minor — though by 1948, when “Afterimage” begins, his marriage with ill-fated sculptress Katarzyna Kobro had become another kind of casualty. Yet Strzeminski is not too illustrious to be spared the petty-minded, punitive policy changes that rain down from on high in this late Stalinist period. He refuses to renounce abstract imagery despite the new official demand for only “Socialist Realist” art that “enthuses” the masses — a wellspring for so much propagandic Soviet kitsch, in every medium. The result: He finds himself first stripped of the position at the school he’d co-founded. Then his works (including the famous, futurist “Neo-Plastic Room” at the Lodz Museum of Art) are withdrawn from public view or destroyed outright. Finally the bureaucracy takes away even his ability to make a living as a sign-painter, buy art supplies, and collect food stamps. He’s virtually driven into a pauper’s grave by the government that had lauded him. 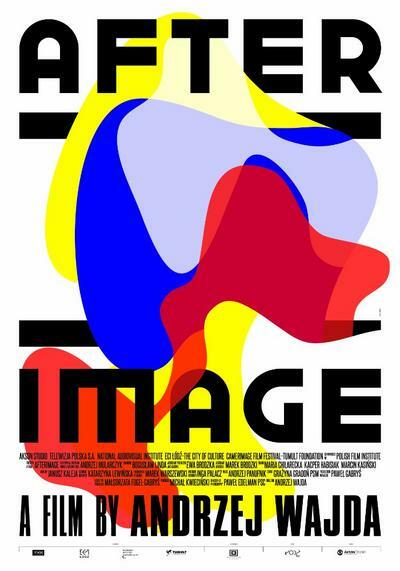 It’s a bitter tale of injustice, certainly, but “Afterimage” could have been more powerful, not to mention more engaging, with a less limited scope. Though Strzeminski often discusses his influential theories of art, these are rather dry stuff without illustrating how he put them into practice — and we don’t see nearly enough of his work here. (When the final credits arrive, their background design of boldly colored abstracts based on his canvases is startling, but too little, too late.) As portrayed by Wajda, veteran scenarist Andrzej Mularczyk and their almost equally storied star Linda, the subject is a stubborn yet passive figure. He’s so single-mindedly focused on his craft that he refuses to use energy protesting the abuses he endures, even when they’re quite literally killing him. This may be true to the historical record, but it doesn’t make for very compelling drama. Nor is there much interest in the human relationships our protagonist absentmindedly tolerates from the young daughter (Bronislawa Zamachowska) he neglects, or the adoring student (Zofia Wichlacz) whose puppy love he shrugs off, among others. These characters tend to hit the same note over and over, bouncing off a central figure that only muffles their impact with his own emotional tone-deafness toward everything but art. All too faithfully reproducing the dull gray palette of a repressive era — the artist’s penchant for vivid color barely factors — “Afterimage” is an accomplished dirge whose downfall chronicle marches with unvarying step toward death. While this grim story is one worth telling, it’s a pity that in relating the bum’s-rush Strzeminski got in later life, Wadja couldn’t have communicated more of what sustains his legacy as a great artist and innovator.